Thanks, Hannah. I like how easy it is to put together, let me know what you think! What great flavour combinations here. This looks wonderful. This sounds great: fresh, bold flavors, with sweet, complex and acidic elements juxtaposed – a perfect compliment to those heavy holiday dishes. I wish I’d seen this before Thanksgiving – but Christmas is just around the corner, so will hopefully be able to find some fresh fennel and give this a try then. I was behind in posting, and I do wish I could have posted it before Thanksgiving. I love how you describe it, this salad gave my tummy a break from the heavier stuff at the table. 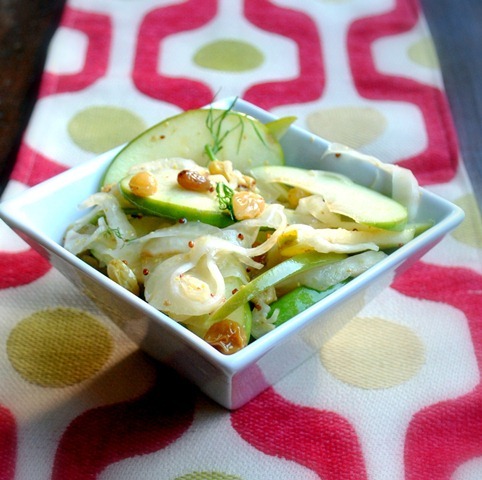 If you can’t find fennel, maybe you can try it with cabbage and add some anise to the vinaigrette? Let me know how you do! That’s OK – I was behind in my reading, so would have made no difference. :) Will let you know how it turns out. Yum. I might have to make this salad for Christmas dinner. I’m usually the one to contribute lighter dishes, and I love using apples in salad. I’ve only bought fennel once (& roasted it), but I enjoyed the anise/licorice flavor. I love the simplicity of this recipe! Lovely salad and I bet delicious! Fennel and apple play very well together.